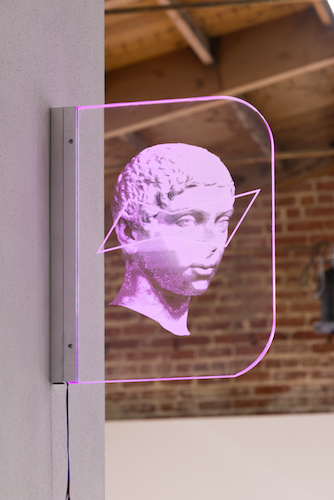 Bernadette Corporation, Heliogabalus Beer Sign, 2017, laser etching on half-clear acrylic, aluminum channel, RGB LED light tape, 16 x 13". The three most common ways to serve in beer pong are the arc, the fastball, and the bounce shot. While the arc is the most efficient at clean entry, the fastball (or kamikaze shot) is an effective technique for wiping out multiple cups at a time, if the house rules that a fallen one be cleared from the table. However, any pro of the game will tell you that no matter the technique, beer pong is a level playing field, as disorderly arrangements of drinks can be repositioned, and experts and rookies alike are at an inebriated disadvantage. Bernadette Corporation’s exhibition “The Gay Signs” (a wordplay on Nietzsche’s 1882 The Gay Science) teases the dominating double-team of power and class by apposing meticulously fabricated beer pong tables, featuring quotes from the philosopher Sylvère Lotringer printed on vinyl (Sylvere Stream 3 Pong [all works 2017]), with treasures culled from MacArthur Park—a major stomping ground for the Los Angeles homeless population. The scavenged finds reside in an infinity mirror, Heliogabalus Pong, near a sign incorporating the Budweiser bowtie logo and the visage of the child emperor/party animal/gender nonconformist/Artaudian muse Heliogabulus (Heliogabalus Beer Sign). The score in this anarchic arena is kept by a LED banner transcript of Kanye West’s rant at a concert in Sacramento last November, shoved into a plastic garbage bin (I love him who keeps back no drop of spirit to himself [Kanye stream]). This show takes language, and artmaking, as a sport. The gimcrack affectation of the display confronts the highbrow concepts of the work. With all the players soused, the tactics of sense are struck from the table, and the cups come toppling down.